Now you can buy PedalMates direct from Creative Mobility Group on this website. Don’t settle for imitators, get the original and the best pedal extensions available today! Shop safely and securely by visiting the link below! 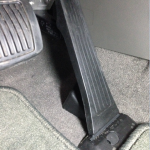 Pedal extensions (also referred to as pedal extenders) are bolt on devices that bring the pedals of the vehicle higher and closer to the driver, providing more space between short-stature drivers and the steering wheel. PedalMates allow you to reach the pedals of your vehicle without overextending your foot. With PedalMates, you will also be able adjust your pedals so you can rest your heel on the floor while driving to alleviate fatigue. The unique design of the product allows for endless adjustments that only PedalMates can offer. The brake (or clutch) PedalMate is fully adjustable with extension lengths from two to seven inches and at heights ranging between three and four inches. The gas PedalMate accommodates varying widths of pedals and securely tightens with a locking screw. It has an adjustable reach of two to six inches using an off-set bracket. The extenders are ideal for short-stature drivers between 4’5″ – 5’5″ tall. PedalMates also provide safe driving solutions for pregnant drivers, overweight drivers, or drivers with knee and hip problems. PedalMates are designed to extend the driving pedals on cars, trucks, and vans to allow the driver to sit a safe distance from the vehicle’s airbag. Sitting too close to the steering wheel and airbag of your vehicle can be dangerous. Government experts recommend that a driver’s face and chest be positioned at least 10″ from the airbag. PedalMates gas, brake, and clutch pedal extensions provide a safe, simple and inexpensive solution for short-stature drivers to achieve this position. The Creative Mobility Group (CMG) does not accept any returns after thirty days of the date of receipt. All returns are subject to a 15% restocking fee. Please note, shipping costs will not be refunded. CMG reserves the right to inspect the product to determine its physical condition. If the product is not returned in acceptable condition, CMG may return the product to the purchaser without credit. Please call 888-998-4264 for prior authorization for return. We are the official online retailer for PedalMates. PedalMates have been featured on Car Talk and in the Detroit News. Please feel free to contact us at 888.998.4264 to speak with a representative or click the chat icon in the lower right corner of your screen to chat with a live support agent.